CAIRO, Egypt — Hagg Mohamed arrives at the bar just before 10 a.m. and orders his first drink. A dozen other customers are already several glasses down, all slouching on a short bench against the tile-covered walls. An old fan above sits motionless, and the narrow room reeks of smoke, stale alcohol and boiled onions, served alongside the alcohol. As the early morning light pours in through a hole in the ceiling, Hagg Mohamed begs the bartender to turn off the bright fluorescent lights above. Raucous laughter and cursing ensues from the inebriated old men in the now dimmed room. As Hagg Mohamed grabs his walking cane and attempts to stand, one of the more sober of the old men breaks up the feeble attempt at a fight before it even starts. Five minutes later, with fresh cups of bouza, all seems forgotten. It’s a typical morning at this unassuming bar in Cairo’s Bab El-Shariya district, one of the few remaining places to order bouza in Cairo. Bouza, the only drink on the menu, is a homemade alcohol produced from barley and old bread. The ancient Egyptians were among the first to discover that fruits and barley could be fermented and drunk. Bouza in Egypt today is likely the closest surviving ancestor to the oldest beers of the Pharaohs. The bouza-brewing process begins in a sealed room at the back of the fly-ridden bar, with the bartender/brewmaster dripping water over barley seeds in clay jars until they spout. The malt is then crushed, mixed with water and bread for its yeast content, then slow-boiled and left to ferment. After just four days, the resulting concoction is filtered into a khaki-colored liquid, thick like paste, with an acidic aftertaste similar to a cross between a flat beer and sour bread pudding. “It’s a very cheap process to make. Customers come here to drink bouza because it’s not very expensive,” says the bartender. A huge mug of bouza costs only 30 cents, compared with the cheapest bottle of Egyptian beer, which can range anywhere between $2 at a local bar and up to $8 at a five-star hotel. The United Nations estimates that nearly one-fifth of Egypt’s population earns less than $2 per day. 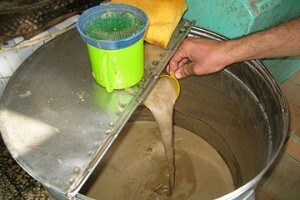 Fifty-five year-old Ibrahim has been drinking bouza for 40 years. He started drinking the day his father died. Every day since then, Ibrahim has come to the bar, 30 minutes from his home in the outskirts of Cairo, to drink between four and 10 cups of bouza — before starting work as a taxi driver. “You know, I drink bouza for a pick-me up. It makes you feel good,” says Ibrahim, well into his quota for the day. A normal morning at this bar is atypical for most in this majority Muslim country. For most Egyptians, alcohol is frowned upon and considered haram, or forbidden by Islam. Still, alcohol here is legal. Egypt has become a popular destination for visitors from its more conservative neighbors for that very reason. Indeed, with a vibrant tourism industry sector and a significant minority of Coptic Christians, the alcohol industry in Egypt is flourishing, said Said Sadek, professor of sociology at the American University in Cairo. And just because alcohol is taboo doesn’t mean all Muslims in Egypt are dry. “What do you mean, it’s haram?” screams Hagg Mohamed, juggling his bouza while waving a piece of torn pita bread leftover from breakfast. Mohamed Said, under-secretary for the environment at Egypt’s Ministry of Health, disagrees. Said runs the Ministry department that inspects all food and beverage establishments throughout Egypt. Bouza, Said says, may be acceptable, but it’s potentially dangerous. “We don’t know what kind of alcohol is in [bouza], what kinds of raw materials are being used, or the concentration of alcohol in the product,” says Said. With bouza, the government fears that methyl alcohol, a cheaper but vastly more dangerous substitute for ethanol, is added to the mixture, either by the brewers themselves or by customers spiking their own drinks with liquor brought to the bar. Yet bouza bars, though few and far in between, remain legal as long as the drink is manufactured in storefronts with an alcohol license. Said says his quality control department inspects bouza bars three to four times per year. And despite the worry over questionable content, he argues that there are too few bouza drinkers in Egypt to issue a complete ban. “It’s not a big enough problem. It’s not used everywhere. This is why there are no laws,” says Said. The World Health Organization admits that the low numbers of alcohol users in Egypt present no serious public health problem. But a 2006 WHO report on the Eastern Mediterranean region stated that “home-made or bootleg alcohol may be the main source of alcohol” in the region. Homemade alcohol is commonly used by Egypt’s poor at weddings, one of the rare instances the culture tolerates some drinking. But unlike other countries in the region, Egypt’s alcohol business is a multi-million dollar industry that is highly regulated and heavily taxed. The largest Egyptian alcohol business, Al-Ahram Beverages Company — which is owned by Heineken — manufactures millions of bottles of beer, wine, and spirits for both local markets and export. Still, some illegal activity in the market remains. As recently as last year, police arrested a manufacturing ring of moonshiners in Cairo who were selling bootlegged liquor in foreign bottles, according to local media. Age restrictions are rarely enforced in some alcohol venues in Egypt. At the Egyptian Association for the Prevention of Blindness, Dr. Ahmed Hathoot says that although the number of patients has decreased in the past five years, he still receives several cases of methanol-related blindness each year. Just a small amount of methanol in the bloodstream, he says, can result in liver damage, ulcers, and almost immediate blindness. At the bouza bar, none of the customers deny that they drink bouza because of the price. But they all believe it’s not only safe, but healthier than bottled beer. Hagg Mohamed has no vision in one eye and limited sight in the other. He says he woke up one morning, blinded by his sadness from the day before. Though it happened after a night of drinking, to Hagg Mohamed, the vision loss had more to do with his state of depression.